Lieutenant John Pike’s long reign of burning, eye-watering terror is over. The University of California, Davis, cop that made headlines for blasting peaceful protesters with military-grade pepper-spray last year is no longer employed by the school. Pike, a Sacramento police officer-turned-campus cop, became the target last year of a nationwide campaign spearheaded by activists with Occupy Wall Street and Anonymous after images of him discharging bursts of pepper-spray at the faces of seated UC Davis protesters went viral and caught even the mainstream media’s attention. Outrage over the incident eventually propelled the school to launch an internal investigation into the events of November 18, 2011, and following months of paid administrative leave, a campus official confirmed this week that the school no longer employs. Lt. Pike. 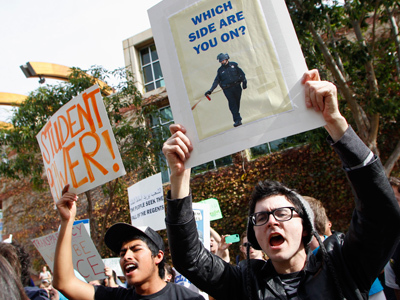 "Consistent with privacy guidelines established in state law and university policy, I can confirm that John Pike's employment with the university ended on July 31, 2012," UC Davis spokesman Barry Shiller tells the Sacramento Bee. Claudia Morain, UC Davis News Service Director, also confirmed the change to CNN, though it is not clear as to whether or not the officer left by his own accord. 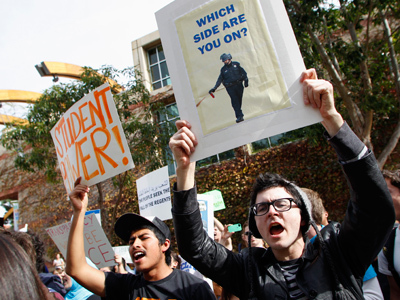 In April, a task force established to investigate the November incident determined that Pike’s actions were “objectively unreasonable” and that the campus very well could have taken measures to ensure that the safety of students and protesters was not put at risk during a demonstration waged against tuition hikes. "On balance, there is little factual basis supporting Lt. Pike's belief that he was trapped by the protesters or that his officers were prevented from leaving the quad. Further, there is little evidence that any protesters attempted to use violence against the police," the report read. "Our overriding conclusion can be stated briefly and explicitly. 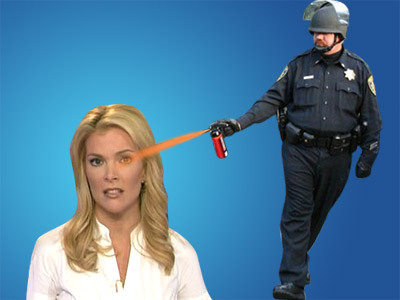 The pepper spraying incident that took place on Nov. 18, 2011, should and could have been prevented," investigators determined. American Civil Liberties Union staff attorney Michael Risher told the Los Angeles Times earlier this year that in addition to being “just wrong,” using “military-grade pepper spray and police violence against non-violent student protesters” was a direct constitutional violation. “When the cost of speech is a shot of blinding, burning pepper spray in the face, speech is not free,” Risher said. Lt. Pike’s actions also prompted a campaign endorsed by members of Anonymous, who publically distributed personal details of the cop and his family on the Web. "We have no problem targeting police and releasing their information even if it puts them at risk," an alleged operative with the group claims in a release from November, "because we want them to experience just a taste of the brutality and misery they serve us on an everyday basis." The Bee reports that, at the height of the backlash, Pike received a barrage of more than 10,000 text messages and 17,000 emails after his personal info was leaked to the Web. Pike was on paid administrative leave up until as recently as mid-July, and the Sacramento Bee reports that his 2010 salary brought him a paycheck of more than $110,000 annually.